The cosmetic world is all about illusion, a world of glamour backed up by the science of formulas, the technology of packaging, and the processes of development, manufacturing, and quality control. Efficacy and results are wrapped up by the magic of publicity used by brands, and presented to make the consumer dream the best packaging. 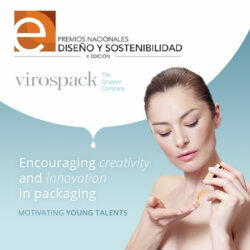 Packaging is the first business card of cosmetics. It remains the first contact of consumers with the product who very often buy beauty products purely based on it. The impact of the packaging on the purchasing act is really high, 96% of consumers are more likely to purchase if they can touch the package at the point of sale. The definition of cosmeceutical is halfway between cosmetics and pharma, products with a higher concentration of ingredients for better results on the skin. 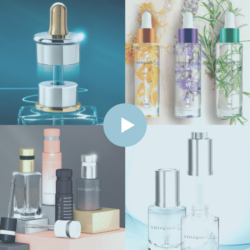 Sleek and clean packaging with an image inspired by science is sure to give the product a cosmeceutical look, really appreciated by current consumers who look for this type of cosmetic concept. Droppers are a strong and increasing trend in beauty. They offer a presentation that’s easy to understand and easy to use by consumers, who associate it with the pharmacy, with the safety and efficacy that this channel implicitly transmits. It is a piece of packaging used every day by more and more brands and not only for skin care, but in other categories with cosmeceutical connotations. Droppers are perfect for these kinds of products due to their high concentration in actives and drop by drop application where the skin needs it. An application that is clean and with an well-known gesture highly valued by many consumers. Packaging is a valuable medium for communicating with the consumer. It is an element used to transmit the values of the brand many times. However, there is now a trend to use it not only as an image, not only to express the brand positioning, but as a display mode to show the performance of the product and how it should be applied. This new trend, called “dermatology-chic” allows the consumer to know how, when, and why to use the product and how it will act on the skin. These explanations appear on the packaging prominently and offer connotations related to science, research and/or advanced technology. Today we have an abundance of information, choice, and messages. We have everything at our fingertips to access brands, their promises, consumer evaluations of them, comparisons with competitors, and more. This has many benefits but it also makes it harder than ever to find what we want. Thus we have another trend to reduce many impacts. Consumers value short and digestible messages and they trust brands with packaging that transmits clarify and simply. This is not just minimalism, is essentialism. Where minimalism says “less is more,” essentialism says “enough is enough.” A trend that focuses on the essential, on clarity of message and on creating an emotional relationship. No doubt the dropper container is intuitive, an essential element, with clear advantages like accuracy in the dosage as well as in the drop by drop application. Sizes are changing, too. Mini-sizes and travel formats are still trending, but the new trend is ‘right-sizing’. Smaller than standard and larger than mini, these new capacities allow products to be portable, not only for a weekend, for many days. The consumer today is very busy, has a very active life and appreciates everything that makes life easier. Women often travel, play sports, or go to the gym regularly, they retouch at work when they have an appointment without time to go home. Manufacturers and brands are working to adapt to these new needs. The idea is to offer new formats that are portable and always in the bag, and not simply reducing the capacity but the size. Smaller containers mean less waste disposal and reduced secondary packaging, allow portability of the product. It’s a new trend that saves money and avoids waste of materials and product, a good mix. To play with special finishes offering customization to brands is another clear trend in the cosmetic market. Special finishes to achieve greater visual impact on consumers causing a sensory impulse that invites them to touch the container, increasing their desire to buy the product at the point of sale. Different, rich, pleasing to the eye and touch: innovative finishes to provoke engagement and in the end, to generate a purchase. Beauty consumers are more aware of how their buying decisions affect the environment. As the same time they recognize their impact on the planet, products and packaging are influenced by this trend extending into the beauty segment. Adding to this eco-awareness is the incorporation of natural or colourless closures, sustanaible wood touches, or high-quality recycled plastics. Brands are paying attention to the amount of extra packaging they’re generating. As a result, the reduction of secondary packaging is a clear trend in the beauty market, a reduction of waste to protect the environment.